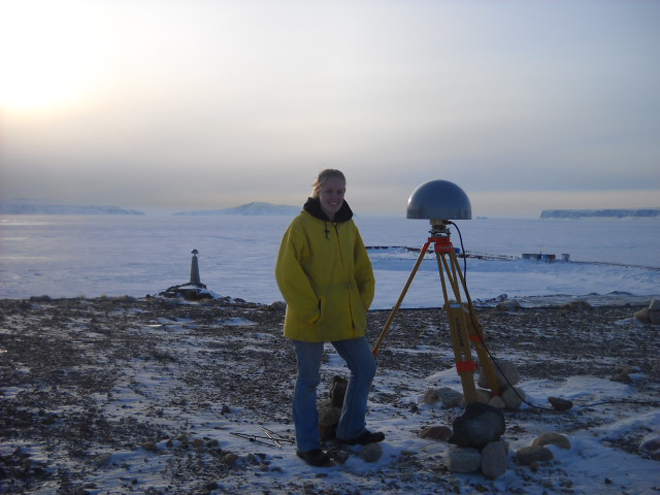 On April 6, the IceBridge blog received a comment from a first-grade class in response to a March 30 post,”Notes from the Shack.” The class asked a series of questions based on Colleen McIntosh’s words and photos from Thule, Greenland, where she is working as a data analyst and programmer in a GPS Shack during NASA’s IceBridge mission. Answers to the class’ questions, below, were compiled by McIntosh. Students: How cold is it there? IceBridge: During the time we have been up here the temperatures have ranged from -12 to 35 F. Typically, like just about everywhere, it is colder in the morning and night, and as the sun rises higher in the sky it warms up. However, on average for the last week or so, it has been around 11 F throughout the day. Students: Does it ever snow? IceBridge: Yes it does snow here. However, it is extremely cold and dry up here. When the air is very cold there is a lack of water vapor. Snow is of course made of water, so if it is too dry — even though it may be very cold — it is less likely to snow. And if it does snow it doesn’t snow a whole lot. But since it is so cold up here, when it does snow, it takes a very long time for the snow to melt. So there is snow up here that may be from snowfalls months ago, it just hasn’t melted yet! Students: How many people are working with you? IceBridge: It depends on what you mean by working with me … working on the LVIS instrument, there are five of us (including me). 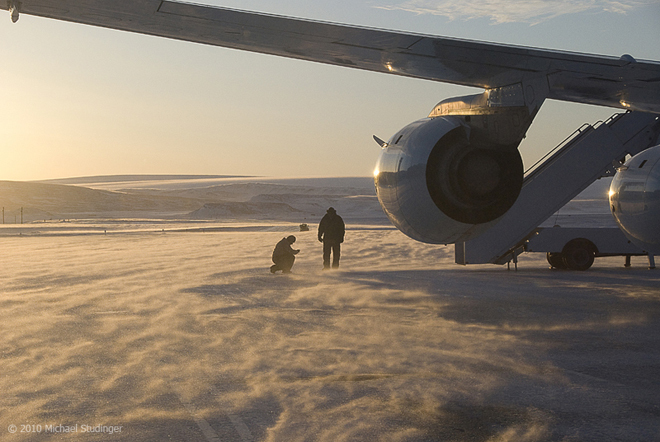 On the IceBridge mission, there are about 70 people, however, they are not all up here at once. On average there about 30 people in the IceBridge group in Greenland at one time during this mission. And out of all of those 70 people, only SIX are women!! Also on the entire Air Base in Thule, including contractors, natives, and Air Force people, there are only about 400 to 500 people, only about 75 are women! Oh and there are also children up here as well, most are the native Greenlandic children, but there are a few children who are visiting their mother or father who are stationed up here in the Air Force. Students: Is it ever springtime there? Students: Is that mountain made of ice? IceBridge: No, Dundas Mountain is made out of rock and dirt, just like mountains we have in the United States. It is just surrounded by and topped with a lot of snow and ice this time of year. You can climb the mountain when it is warm enough, but it is a very hard climb. Toward the top there is even a rope to help you pull yourself up the rest of the way up the mountain because it becomes very steep! Students: How tall is that mountain? Students: How far away from where you are standing is the mountain? 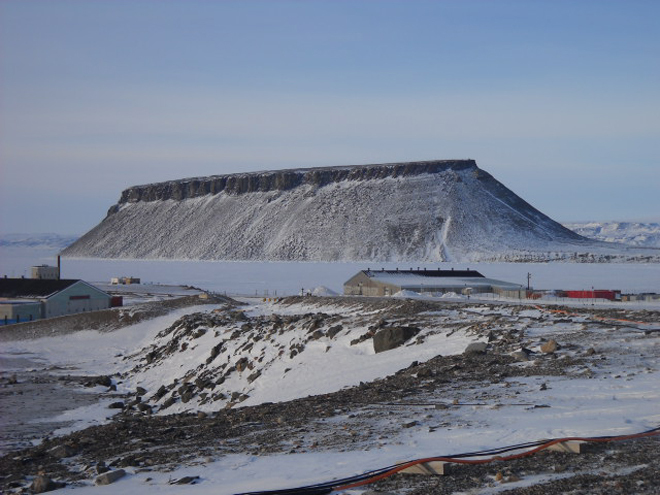 IceBridge: It is about 1.5 miles to Dundas Mountain from the GPS shack. Students: Why does the sun look so big and so close to the Earth? IceBridge: When celestial objects, like the sun and the moon, they get closer to the horizon and they “appear” bigger. However, this is just an optical illusion. The fact is that the illusion is dependent entirely on the visual cues provided by the terrain when the moon is near the horizon, and the lack of such cues when it’s at the zenith (directly above our heads). To prove this, try viewing the moon through a cardboard tube or a hole punched in a sheet of paper to mask out the landscape — the illusion disappears. This time of year time of year the sun stays in the sky for almost 24 hours. Come April 17, the sun will not set here for the next three months. This is because of the way the Earth is tilted. 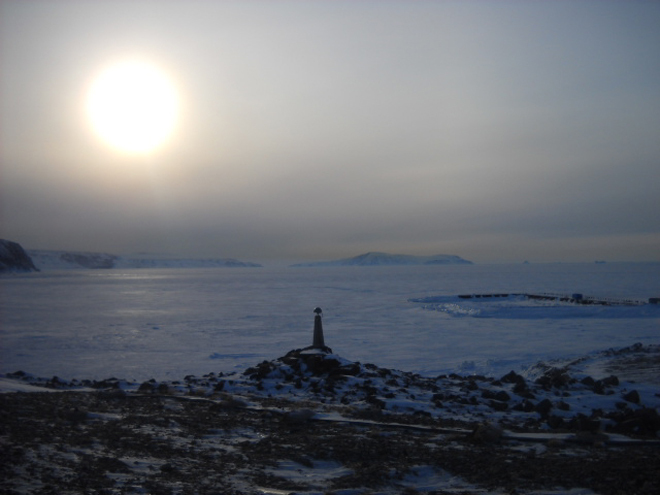 Right now the Earth is tilting toward the sun, and because Greenland is just about at the top of the world, the Earth’s top always sees the sun. But something to note is that although the sun does not set for three months, the temperature still only reaches 60 degrees at its hottest! Students: How do you make electricity? IceBridge: There are several diesel generators that power the entire base. Also on the base are several cylindrical containers that hold the fuel for the airplanes that land and take off from this base. There used to be a lot more containers, but now that the base isn’t used as much as it was in the 1950s and 1960s, they have taken out these containers. Staying on the ground as part of the GPS base station crew, there isn’t a whole lot to do as far as maintaining the receivers. 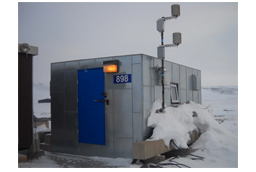 The Land, Vegetation, and Ice Sensor (LVIS) team has three receivers, all different. We have a Javad which records data at 20 hertz, a Novatel which records data at 10 hertz and an Ashtech which records data at 2 hertz. These receivers are running all day every day. 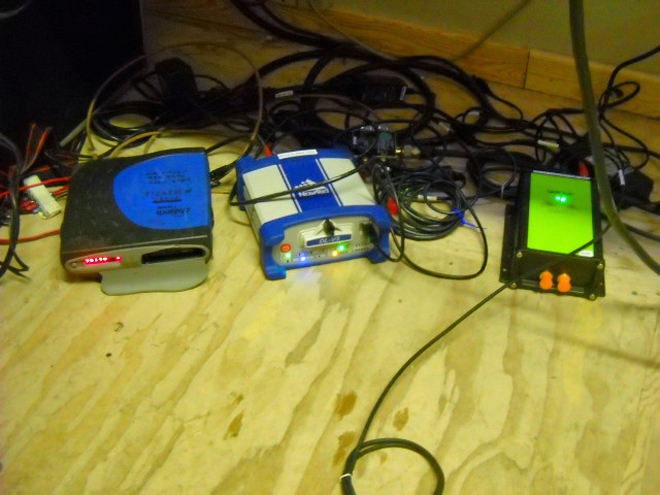 Running receivers at different frequencies is somewhat of an experiment. The higher the frequency the more data points you get and, theoretically, the better the results. We are just testing that theory to figure out the best rate for LVIS. I check on the receivers twice a day: once in the morning before the flight takes off, and then again an hour after the plane lands. The most important data, of course, is taken while the plane is in flight. The remaining data is used to get the most accurate position of our base station possible. Inside the collected data file are coordinates, which should be the same from day to day, but nothing is perfect, so they are slightly different. We take an average of the coordinates, and I use those values when processing the data. It may seem that I only do something before and after the flight, but while the plane is in flight I process the data collected from previous days. 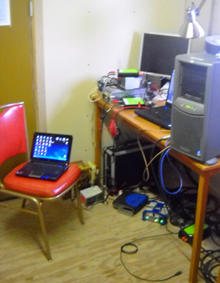 The internet is rather slow up here, so sometimes processing can take some time.